When I checked a link to video at my earlier post about trees falling in Central Park, I found it had expired, but happily located a new one to replace it that is even better. I suppose it's going to take some time and more events like this one, a wild storm in Europe that knocked over trees and branches, which actually caused quite a few injuries and deaths, before most people detect enough of a pattern to understand that there is something more substantive going on than random bad luck with the weather. 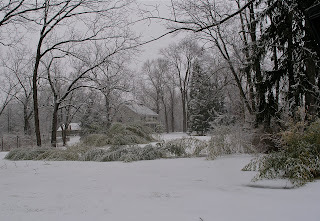 This last snow was very heavy and wet, it flattened my bamboo, which have since bounced back. This female robin found something to nibble upon from these shriveled vines. I am so excited! I ordered a new fancy schmantzy camera, after much agonizing, having decided that since the world is going to hell in a handbasket anyway, I may as well take the best pictures of what remains that I can. 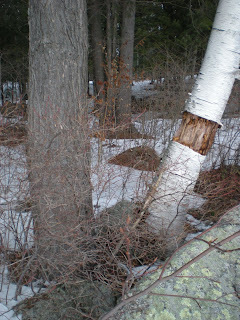 Today it was over 40 degrees F., and in the thaw many trees were losing sap from their trunks and branches. 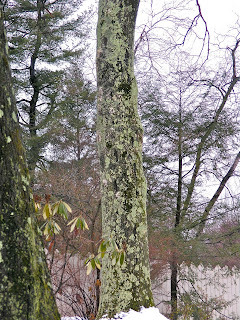 The tree in the foreground is, and there is another, further back on the right, that has the identical problem. 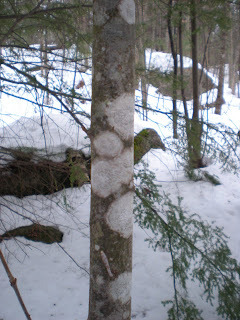 This oozing of sap must have something to do with the bark falling off. 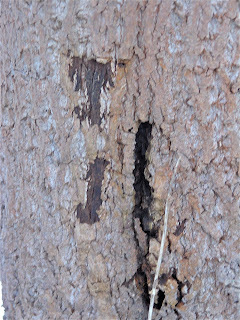 In instances where it isn't actively wet, it leaves stains on trunks where it has plainly been exiting from holes - and there are more and more holes. 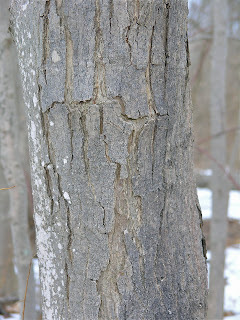 Smaller trees are just as apt to be losing their bark as larger trees. 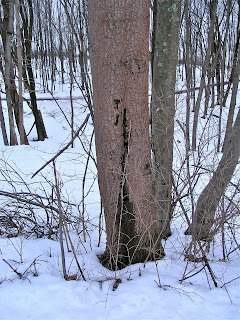 This slender trunk has a diameter of only about 6 inches and its bark is splitting and peeling. 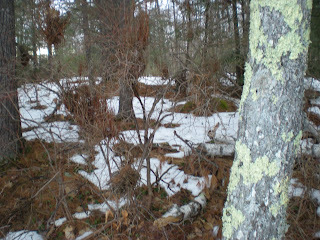 It has spots of dried sap depositions on the surface. 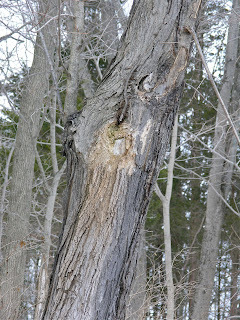 And the protective bark is peeling off high and low. 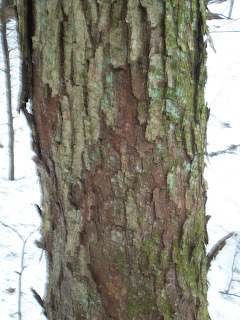 This is very serious because it is becoming evident on every species of tree, of all ages - and the time between when bark begins to fall off and the tree is completely and obviously lifeless is very brief. It is as though you started bleeding through your skin, and then it fell off. Zombie alert! 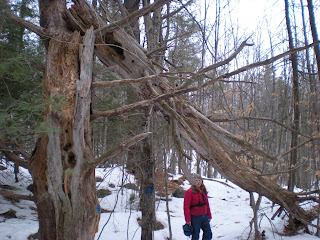 In addition, I am being amazed at how quickly trees are turning from alive to completely rotted, whether still standing or fallen on the ground. I wonder if there is something in the atmosphere that is accelerating the process of decay in addition to causing universal decline. 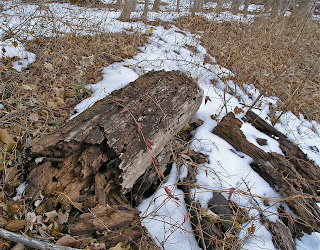 There are old stumps around my home that had persisted in pretty much the same shape after being cut down three decades ago, but now it seems like trees disappear in a matter of a couple of years. Bizarre! It's early for these oyster mushrooms to appear - I guess somebody forgot to give them the memo about what a cold winter it's been! It's early for these to be flourishing as well. When I get a chance, I will check on the daffodils that emerged in December. 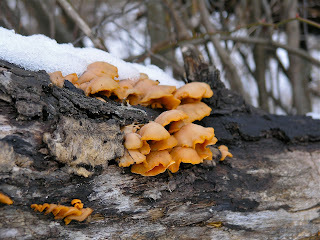 Last time I looked, in mid-January, they were still there, slightly larger. I have just noticed, (duh!) that I can create separate pages for the blog, that open with tabs. This is a bit of a project, because I would like to go back and collect all the links to scientific research and organize them separately, so if anyone is looking for that (including me! ), they won't have to slog through all of my personal observations, speculations, and diary entries. Until I figure out the process and find the time to revisit old entries though, Wit's End will remain a thoroughly disorganized "loose and baggy monster" as my college literature prof used to call certain novels. And alas the search feature on my blog host is abysmal! Congratulations, Smokin' Hot Smart Brat! 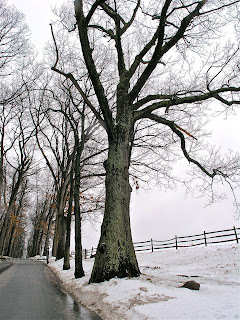 This blog is ostensibly about trees, and why they are dying at an unprecedented clip, thanks to toxic polluting greenhouse gas emissions, from burning fossil and biofuels. But hey, I'm stuck in the snow and so, I digress. Scrolling down will lead to the tree links, but for now, we have a lovely image, with all the rich iridescence of an opal! The Apocadocs have uncovered a doozy this time! Arctic arch failure leads to sea ice exodus. What does that mean, praytell? Apparently, "...the heavy ice traffic leaving the Arctic could lower the salinity of the water enough to affect ocean circulation." Hmmm let's think. Where have we heard something about Thermohaline Circulation before??? I can't wait to read this book, because it is apparently also about the intellectual and emotional consequences of going through the process of enlightenment. Many of the "ignorers" will need resources like this, if we are not to rapidly descend into fascism and fanatic cults once the inevitable effects of climate change manifest to the extent that even the most devoted denier will have to acknowledge the truth. And what else? Coffeepartyusa is launched! This could be historic - click here for my forum topic on climate change, and please, add to the discussion. If we are going to be lucky enough to finally have a truly progressive movement to dump the legislators that are owned by corporate lobbyists, I hope that climate change will be the number one issue...which is an excellent reason to pass healthcare reform already! Recommended reading: Requiem for a Species: Why We Resist the Truth About Climate Change by Clive Hamilton, seen at Apocadocs, which has a useful compendium about species loss in this, 2010, the International Year of Biodiversity. Hah! Check out this video about "healthy" tree branches falling in Central Park - because it's snowing! It hadn't even been windy at that point in the storm. This is, of course, nonsense. 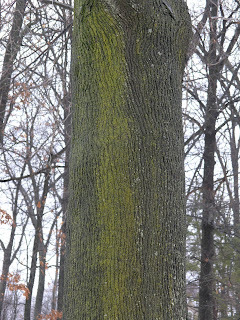 The trees are weakened by exposure to toxic greenhouse gases, which interferes with their ability to photosynthesize, and produce chlorophyll. 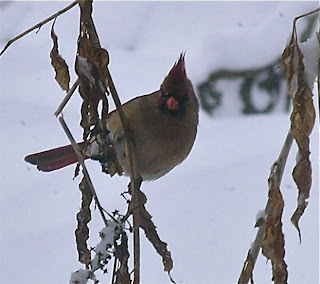 These photos are from the last blizzard, in Washington. The Park Service acknowledges that many of the famous cherry trees split, lost branches, and fell over, but they say the trees are "resilient" and will be fine. Of course they say that! Can you imagine if they told the truth, and then the tourist bureau would go berserk! Update, here's a tweet I just saw! Last week a flock of robins descended, at least 100 of them. And they are still loitering the premises! 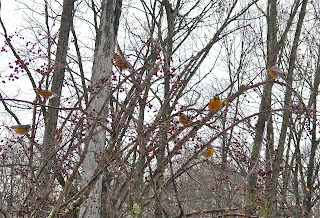 The dried fruit on the crabapple trees have been hanging, shriveled and unappreciated, all winter - so I was glad to see that the robins enjoy eating them, and to hear their singing. 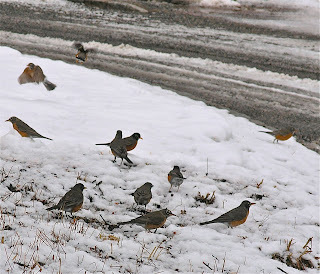 Is it early for robins to appear, migrating in such multitudes? I don't know - but last week I saw an opossum, and I have to wonder about that too. 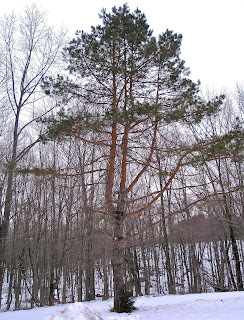 Following are a few examples of the prevailing trends that make for the inescapable conclusion that unprecedented things are occurring in our tree population. I'm not sure why exactly, but I do know, none of this is normal, or beneficial. 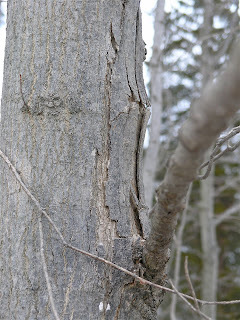 First - bark is frayed, splitting, and falling from trunks and branches. 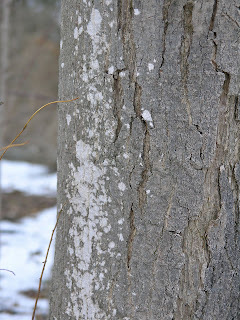 This happens to be a dogwood - but you can find the same thing on every species. 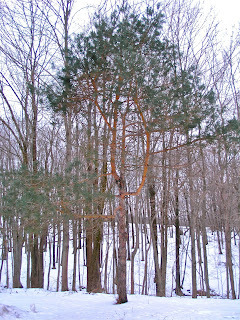 It's unbelievable how fast this trend is visible, among trees young and old and in between. 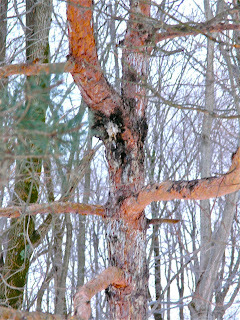 Nasty opportunistic fungi and molds and lichens are proliferating at an astounding pace. 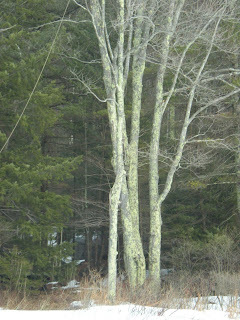 Huge old trees like this have been swamped with lichen. 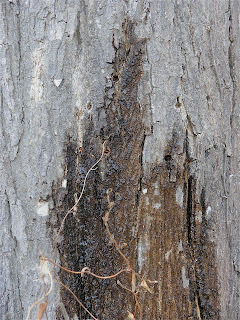 Many are sprouting cankers, which are one of other indices of lethal fungus. 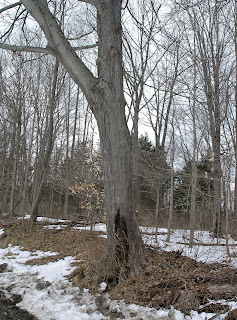 It just cannot be healthy for a tree to be inundated with a growth like this. 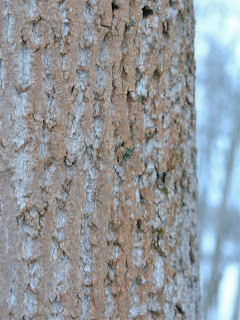 It's to the point where hardly any bark is left that isn't garbed in another alien organism. 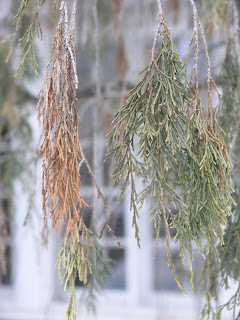 Every sort of conifer is either totally bare of needles, or thin. This makes for a very changed landscape, where the view into a mixed wood is wide open, through pines that until this year were solid walls of greenery. 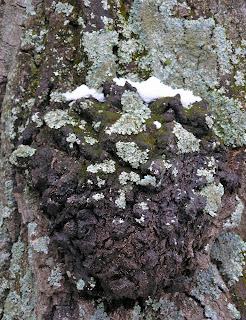 Here is yet another new, and not yet identified, bizarre pigment appearing on trunks and branches. It is a strange red hue. 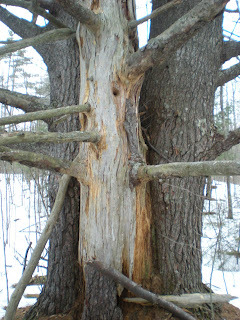 Here is a closeup of a rampant calamity - splitting and seeping, bleeding sap. The woman who planted this Alaska Cypress is quite a devoted gardener. Last fall, it was a cascade of lush green. You couldn't see through it to the wall of the building. It's a very special and unusual specimen. I was curious about the species, so I asked her what variety of conifer it is. Then to be polite and respectful, even though it's obviously on death's doorstep, I blurted out something awkwardly dumb like, well, it's just lovely! To which she replied, with a pained and stricken expression, "Thank You!" 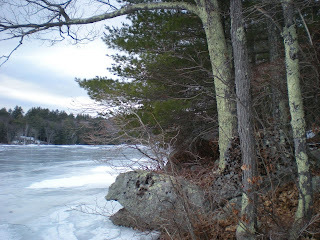 This is a second guest post from Susan, who lives in Massachusetts and cross-country skis in the Granite State - the photos were taken by her husband, Roger. Thanks guys! 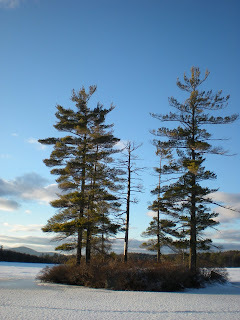 Half of the tall pines on this tiny island are dead, and the remainder are thinning, and top-heavy with pine cones - a signal of their own imminent demise. 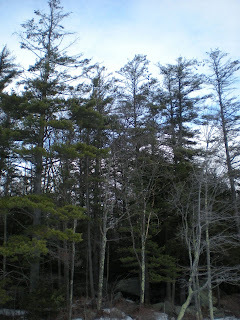 Thinning tops mark these white pines, as well as lichen-covered branches. 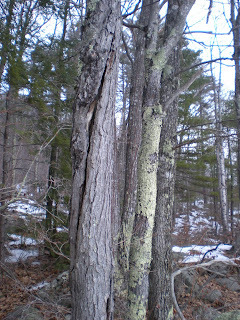 Lichen-covered tree trunks are pervasive. 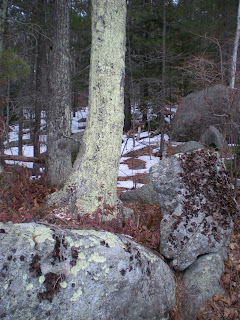 The inanimate granite rocks and trees share a common friend. How long until this tree joins the ranks of the non-living? 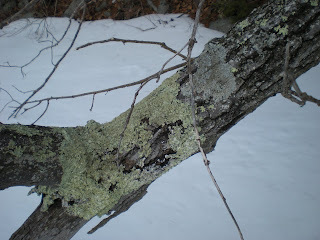 Here is a lichen-covered, splitting trunk. 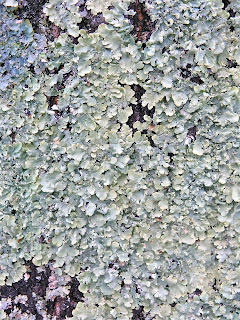 Close views of lichen on bark. 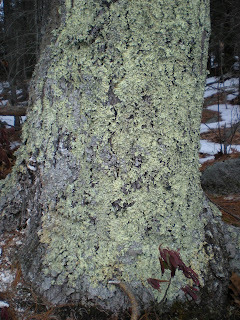 The presence of lichen is closely associated with decay. It is spreading unchecked, consuming entire trees. 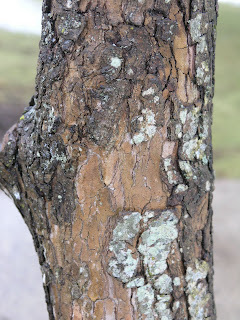 The flaking bark cannot be an indicator of health. 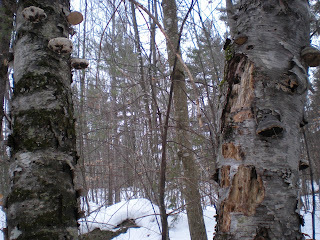 White birch are particularly affected by peeling bark syndrome, and polypores. Finally the birch succumb, but their classic white silhouettes are still beautiful against a blue winter sky. This sight is becoming all too common. 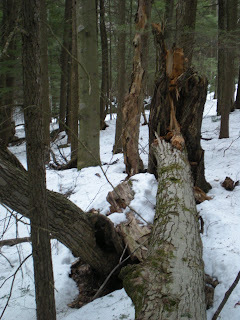 There is a plethora of fallen trees, despite a lack of severe storms this season. 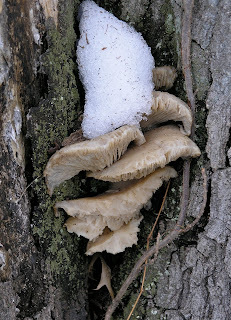 This tree is sporting a white fungus to match the snow. 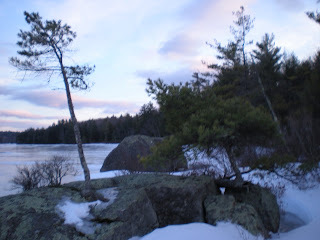 Thinning pines dot the pond's shore. 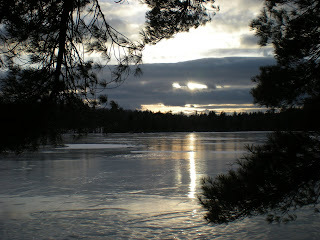 Nature is so gorgeous - how can we allow ourselves to destroy it? 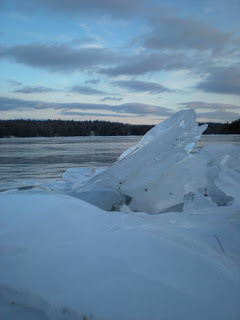 Water breaking over a rock creates a natural ice sculpture. Will my great-grandchildren be treated to seeing this at our New Hampshire camp? 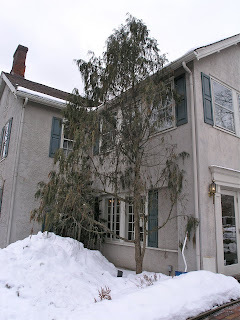 junipers and yews and cedars, oh my!